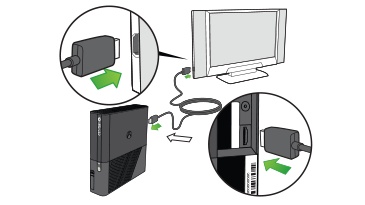 Learn how to connect your Xbox 360 E console to high-definition or standard TVs and monitors. The HDMI (High-Definition Multimedia Interface) cable is the most common cable to use with HDTV and high-definition monitors. Connect the HDMI cable to the HDMI port. Connect the other end of the HDMI cable to the HDMI input on your HDTV or monitor. Turn on your TV and console. If you do not see the Xbox Dashboard when you turn on your TV and console, you might need to select the video input. The console automatically uses the default display settings. If you want to try to improve the video display, you can change the settings on the console. Connect the small 3.5mm connector to the appropriate port on the console. 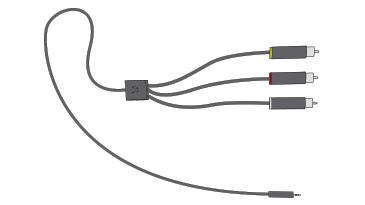 Note Monaural (mono) TVs have only one audio port. Connect either the red or white connector to the TV. Turn on the TV and console. When you turn on the console and TV, you should see the Xbox Dashboard on your display. If you do not see the Xbox Dashboard, you might need to change the video input setting. To change the video input setting, refer to your TV or Entertainment Center manual for instructions. To improve the video display, you can change the default settings. Would you like to contact Support regarding the "Connect Your Xbox 360 E console to a TV" issue you were reading about or a different issue?